Social networking giant Facebook has just announced a new optional feature for iPhone app users. 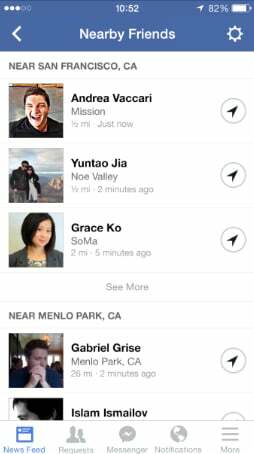 As the name suggests, Nearby Friends will notify you when Facebook friends are near your location. Because of obvious privacy concerns, the feature is completely optional and can be turned on and off at anytime. Users can also select who can see their location like your friends, close friends, or a specific list of users. When Nearby Friends is on, you can see when your friends are traveling if theyre also using this feature and sharing with you. Youll be able to see the city or neighborhood they are in, including on their profile. When you see a friend visiting a place youve been, its the perfect opportunity to send a recommendation for a great restaurant. You can also make last-minute plans to meet up with a friend who happens to be in the same place youre headed to. Facebook said the feature will be rolled out to users in the United States over the coming weeks. It will not require an app update. For other app news today, see: Dropbox Acquires Photo And Video Management App Loom, Yahoo’s Flickr 3.0 Adds Live Filtering Tools, Video And More, and MLB.TV Premium Customers Can Now Stream Games Using Google’s Chromecast.